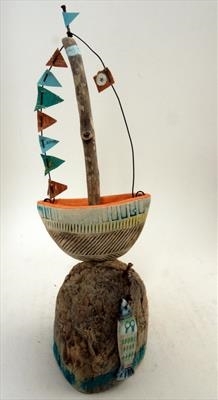 Beautiful colourful hand built boat bobbing along on the ocean with little fish beneath. Free standing sculpture. Beautiful colourful hand built boat bobbing along on the ocean with little fish beneath. Free standing sculpture. 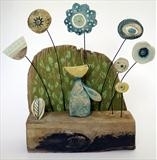 Handmade by Shirley Vauvelle, mixed media artist. Using clay driftwood and bunting.